Every time you look at a search results page on Google, there is a good chance that you may see something new. It wasn’t too long ago that videos, images, author profiles, links to Google plus reviews, and maps weren’t all shown on the same screen. Many people who depend on Google for their livelihoods spend a lot of time and energy trying to predict which additions will be next, but nobody really knows for sure. While there are many changes happening right now to the way Google displays listings for small businesses, Google has made it crystal clear that business reviews will play a huge role in the future. We’ve been able to see business reviews on Yelp, out of five stars, from Google’s search results for a few years, and we’ve already seen Google+ play a more serious role. If you’re the kind of business owner who wants to stay ahead of the curve, one of the biggest things you can do for your business, right now, is to start earning Google+ reviews. We work primarily with contractors that are, lets say, more experienced with water heaters than keyboards. The good news is, if you know how to run your business and satisfy customers, you’re already halfway to dominating your competition online. Phil Barnett Plumbing’s five stars on Yelp have helped push his website to the #1 slot for “plumbers in Livermore,” and together they have helped transform his company overnight. In just a year, he’s doubled his work force, doubled his number of trucks, and outgrown his old building. In reality, having a bunch of great reviews on Yelp, Angies List, Home Advisor, or other local and industry directories can drive a massive amount of business to your company, and drive your website to the top of the results. We’ve seen it happen before, and we’ll see it happen again. 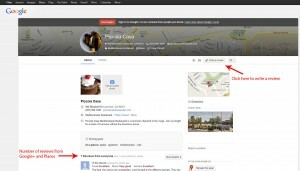 Why get more Google+ reviews, specifically? Google has been making a serious effort to get more users on Google+ over the last couple of years, and late last year they finally broke the 500 million mark. One of the ways they’ve been driving the movement is to offer small kickbacks to active Google+ users, which includes prioritizing businesses that earn a lot of reviews on Google+. For over a year we’ve been seeing business show up higher when they have more (and not necessarily better) Google+ reviews, and everything seems to indicate that the trend will generally continue. If you search for any high competition industry in your local area (try “dentists”, “plumbers”, “car rental”, or “insurance”) and you should see this trend in action. 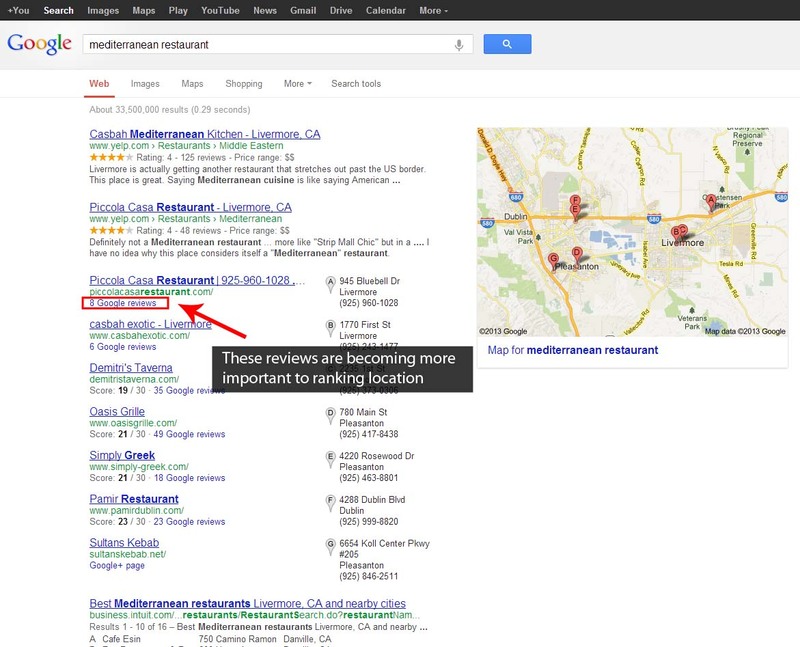 Of the top local listings (those are your A through G results), you should generally see a descending number of Google+ reviews. This also means that, generally speaking, you should see your own business show up higher once you’ve earned a few more reviews. So, let’s work on that. Before a user can leave a review on Yelp, they need a Yelp account. The same goes for HomeAdvisor, Patch, and every other business review platform. The good news is that you only need a Google+ profile to leave a review on a Google+ business page, and most Gmail users have a Google+ account ready to go, whether they know it or not. With this in mind, we’re going to go after the low lying fruit: people who can leave you a review without signing up for anything new. First: We are going to have to consolidate and sort through your customer database to find all the people that have an @gmail.com email domain. Now this can be done by exporting your clients to excel and sorting. Maybe you have all your customers in a Google account, we must do the same and make sure we only send to gmail account. Mail Merge, How to send a personalized e-mail to many people at once. Gmail users can find the same tutorials: Create a Mail Merge with Gmail and Google Docs, How to Setup a Mail Merge in Gmail for Personalized Mass Emails. The Email: What should this message say? We are not going to tell you to force them to write reviews while you’re looking over their shoulder, we are just trying to encourage the people that are using Google plus already to find you on this network. Another thing to keep in mind is to keep the message generic but with a personal touch. Possibly reference that you have done work for them in the past but not specifically what type of work. Unless you want to send each message one at a time, but that is up to you. Please let us know how we are doing with a review so we can help improve our service. See what others are saying about us on Google+. Write a review and share it with your friends..
After your message has been sent out, sit back and see what happens. If this is your first try at social marketing, don’t be discouraged with what you think might be low results. It all has to start somewhere and it will take time to grow. The good news is that it’s harder to get the first few reviews than it is to get the next several. Once people start seeing that you business has many reviews, visitors tend to be more likely to add their own opinion. Note: It’s against Google’s terms of service to offer rewards for writing a review. 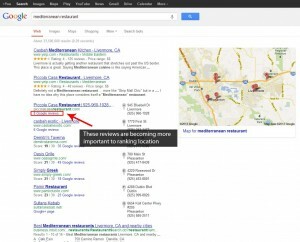 Google can and does remove user reviews that were “bought” in any form. That includes cash rewards, freebies, or discounts. Last: After we have successfully sent out the email, we should go into our email signature and update this to show where we can be found. Add all your social networks and a link to Yelp if you have one. You never know which accounts your email recipients might already have, so hit all the bases. At the end of the day, even if you’re not the kind of person who usually buys into social networks, Google+ is quickly becoming a necessity for business owners. Google is serious about creating more overlap between their services, and it’s clear that they’re happy to give more visibility to businesses that connect through Google owned properties, like Youtube and Google+. The good news is that Google+ is becoming a smarter and easier to use platform every day, and there’s no time like the present to make yourself known. The sooner you start seriously using Google+, the sooner your business will start getting the reviews it needs to succeed. 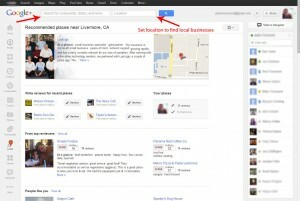 To learn more about how to grow your business on Google+, feel free to ask us here, or on our Google+ page. Best of luck out there, and please don’t keep us a secret! I really do have faith in most of the methods you have released in the post. They can be really genuine and definately will surely perform. Nonetheless, the actual articles are incredibly brief for freshies. May possibly you want extend them a bit by when? Thanks for a write-up.